This article is about the islet in the Abaco Islands. 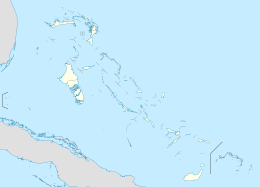 There is also a "Great Guana Cay" in the Exuma Cays. Great Guana Cay is an Abaco barrier island that hosts elkhorn and staghorn coral reefs. It also contains a large amount of virgin forest, where migrating birds and Abaco endemic species live. Loggerhead sea turtles, green sea turtles and hawksbill sea turtles nest on the island's beaches. Both white-crowned pigeons and white-tailed tropicbirds nest on the island. Before removal of the crabbing-ground mangroves by a golf development, land crabs such as mountain crabs were common and were hunted for food by the native population. A cove on the island called Kidd's Cove was named after the pirate William Kidd. Great Guana Cay came to international attention in conservation circles when the residents of the island grouped to form Save Guana Cay Reef, an organization designed to fight the large footprint of the Baker's Bay Golf & Ocean Club, located at Baker's Bay. Jean-Michel Cousteau's Ocean Futures Society, the Sierra Club, Greenpeace, Global Coral Reef Alliance, Mangrove Action Network and other conservation groups are working with the native islanders in a battle against the golf resort, which they say will destroy the island's mangroves and coral reef. ^ "Great Guana Cay". Retrieved 23 October 2014. ^ "Advocacy giants Citizens for a Better Bahamas and Save The Bays join forces". Retrieved 23 October 2014. This page was last edited on 3 January 2019, at 07:12 (UTC).